There were 24 posts published in July 2007 (this is page 1 of 3). There are so many things wrong with this article, it defies my ability to count. Literally every paragraph has some sort of inaccuracy! On the darker side, there are also weapons armouries in SL where people can get access to guns, including automatic weapons and AK47s. Searches of the SL website show there are three jihadi terrorists registered and two elite jihadist terrorist groups. Once these groups take up residence in SL, it is easy to start spreading propaganda, recruiting and instructing like minds on how to start terrorist cells and carry out jihad. That’s right – al’Qaeda’s new frontier? SECOND LIFE. Rohan Gunaratna, author of Inside al-Qa’ida, says it is a new phenomena that, until now, has not been openly discussed outside the intelligence community. But he says security agencies are extremely concerned about what home-grown terrorists are up to in cyberspace. He believes the dismantling and disruption of military training camps in Afghanistan and Pakistan after September 11 forced terrorists to turn to the virtual world. Obviously Mr. Gunaratna hasn’t been getting the news from Pakistan recently. Understandable, he’s busy infiltrating W-Hat looking for the WMDs, I guess. But fear not! 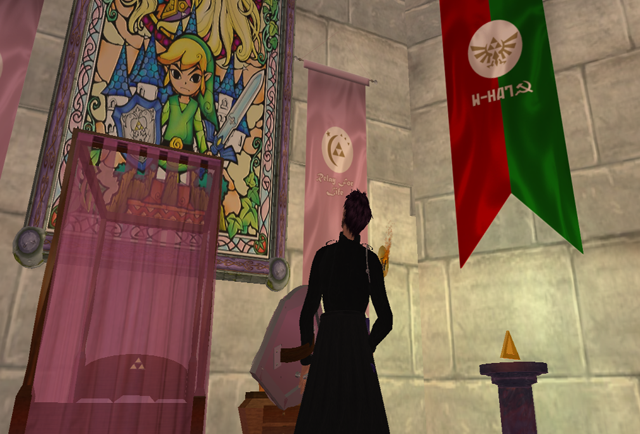 There are, of course, terrorists in Second Life. SOVIET terrorists. Nobody likes me calling it a Leninist conspiracy, but that’s because they take these two words very literally. Leninist merely means people for whom the ends justifies the means, that is, they believe their cause, which is to disrupt the grid and have people not take it seriously, justifies even violent and criminal means, just as the Bolsheviks did. They also understand, as Lenin did, the usefulness of having people smeared like “Prokofy Neva” or “Mia Linden,” and they understand the utilitarian value of the useful idiots like Tateru, who distract from the conspirators. And here, conspiracy is used not in some tinfoil outerspace notion, but in the direct, criminal-code language defining overt acts planned and committed by two or more people in a group. But you World of Warcraft players snickering into your temporarily undersized shoulder pads should know that the terrorists ARE INSIDE THE HOUSE. DO NOT PUT DOWN THE PHONE. Kevin Zuccato, head of the Australian High Tech Crime Centre in Canberra, says terrorists can gain training in games such as World of Warcraft in a simulated environment, using weapons that are identical to real-world armaments. Zuccato told an Australian Security Industry Association conference in Sydney that people intent on evil no longer had to travel to the target they wanted to attack to carry out reconnaissance. He said they could use virtual worlds to create an exact replica and rehearse an entire attack online, including monitoring the response and ramifications. “We need to start thinking about living, working and protecting two worlds and two realities,” Zuccato says. I do agree with Messr. Zuccato: we need to start thinking. It would be a nice change of pace, at any rate. A dark game of mystery, intrigue and dodongos. The Zelda Quest is what you make it out to be, you can spend your day leisurely exploring and collecting rupees or you can take the offensive and pound some rupees out of the various guards and monsters around Hyrule. If you were particularly cut-throat you could attack other players, and steal their rupees! That’s right – Rupee to crush. It’s for a good cause, so get out there and dislike some smoke, courtesy of your griefy friends at W-Hat. When you have thousands of prisoners at your beck and call, there’s clearly only one thing to do: restage 1980’s music videos. More on this on the BBC. Apparently, spam scams are so popular in Nigeria, they’ve gotten their own music video. Sadly, he was recently chopped himself. Sadly, this actually makes me want a Wii.